There is much to admire about South Africa’s relative progress and stability in the almost nineteen years since its first multiracial election, but its school system is truly an embarrassment. Despite the country’s upper-middle-income classification, many areas that were formerly designated as so-called “homelands” (i.e., the Transkei and Ciskei), resemble the poorest areas of many of Africa’s poorest countries. 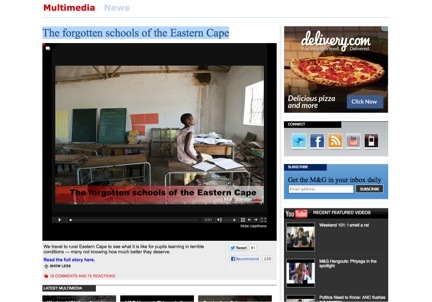 I paste below a link to a wonderful but depressing story about the dismal state of Eastern Cape schools — sometimes referred to as the “mud schools” because several are made of mud. It highlights how the Legal Resources Centre (LRC) has been working to protect children’s rights to education, suing the government to provide appropriate resources. It should not be necessary to litigate for decent schools for the poorest kids, but at least that avenue is available and seems to have had some impact.